Our sponsor and friends at @tsheets, time tracking employee software, took over the chat focusing on the TSheets PRO Program. Kelly (@KellyTsheets) manned the @tsheets handle from Boise, Idaho, and we were also joined by Dan (@DBuckTsheets) and Danny (@TSheets_Danny) during the TSheets Takeover. Q1: Are you familiar with TSheets/the TSheets PRO program? The @tsheets PRO program is a partner program where PROAdvisors have access to an exclusive level of partnership with @tsheets. As a PRO, you refer clients to @tsheets to save them time and money on payroll, job costing, and invoicing. Many of our chatters are PROAdvisors including @accountingpeace, @CathyIconis, and @BizBooksCloud. TSheets gives TSheets PROs designated support, a free TSheets account and commission on all referrals. @accountingpeace: How do Commissions work? Does a client have to be onboard for a certain number of months? 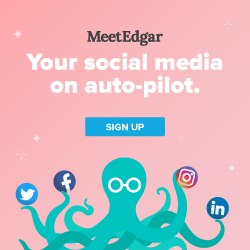 @KellyTSheets: Nope – the PRO starts to accrue commission the first month the client is paying! Q2: What do you or your clients like most about TSheets? There are many @tsheets features to like, including GPS tracking, ease of use on a mobile device, ease of use overall, amazing customer support, integration with QBD, the scalable feature set, and reports available. 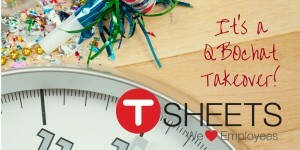 TSheets is time tracking made simple! You can track time anywhere, using any device, in real time! Another reason clients love TSheets — it integrates with QuickBooks Online! And, of course, we Partner with some AMAZING apps. Q3: What’s your favorite thing about being a TSheets PRO? Being a PROAdvisor has many perks (check out a list of some of them here). Some favorites mentioned during the chat are getting great customer service from the @tsheets team and having more credibility when recommending a @tsheets product. Plus there is also a PROAdvisor Facebook group. And PROs know that when you’re a TSheets PRO, you get rewarded for referring! Earn a commission on all referrals, plus, who doesn’t love TSheets SWAG?! Then there was that one time when a few PROS won BIG in the #10KChallenge! Way to go 2015 #10KChallenge champs @ChristineGalli @btnllc and Penny Lane! Q4: What do you think is the #1 benefit of getting your clients to track time using TSheets? There are many benefits to using @tsheets including mobile integration, unlimited support, and smart integration accounting software. 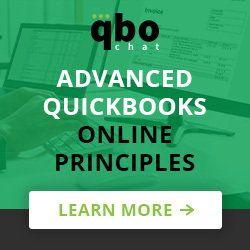 Our #QBOchat-ers also like that they don’t have to purchase a time clock, the easy integration with #QuickBooks, ability to see who’s working when and where, ability to create groups of employees and track by a group, and the time it saves users. It’s a huge time saver for clients! Their time is accurate and payroll takes less time. Shout out to PRO @DanethaDoe who tracked her time for 30 days + shared her experience! Q5: Give an example of a client you’ve referred to TSheets and what got them excited about it. @tsheets loves client referrals, so much so that they dedicated a blog post to that very topic last year, 10,000 Reasons to Refer TSheets, as part of the TSheets $10k Challenge. Referrals combined with great product features makes for a winning combination. We hear that a lot of clients get excited about TSheets Who’s Working feature-see what your employees are working on + where. New clients are also excited about the addition of TSheets scheduling! @BrightBooks : One client was just starting payroll and was freaking out about the process until I showed her @tsheets. Now she is calm. @Kaydee_411: GPS gets my people excited! Is there anything else you love about @tsheets that wasn’t mentioned in the TSheets Takeover chat? Leave a comment below. And remember to sign-up for our newsletter to get the most up-to-date news on #QuickBooks and #QBOchat.